Last week I visited Paris, France! MBC and I were celebrating our birthdays, and recalled that last year we celebrated in Paris, Texas. This year, we were photographed in front of the Eiffel Tower again—the original one! MBC posted lots of pictures of me visiting historic landmarks on our Facebook pages. Her uniform is a plaid kilt and necktie, and she wears her hair in braids. She’s a survivor of an accidental gas explosion that destroyed her store in February, 2014. 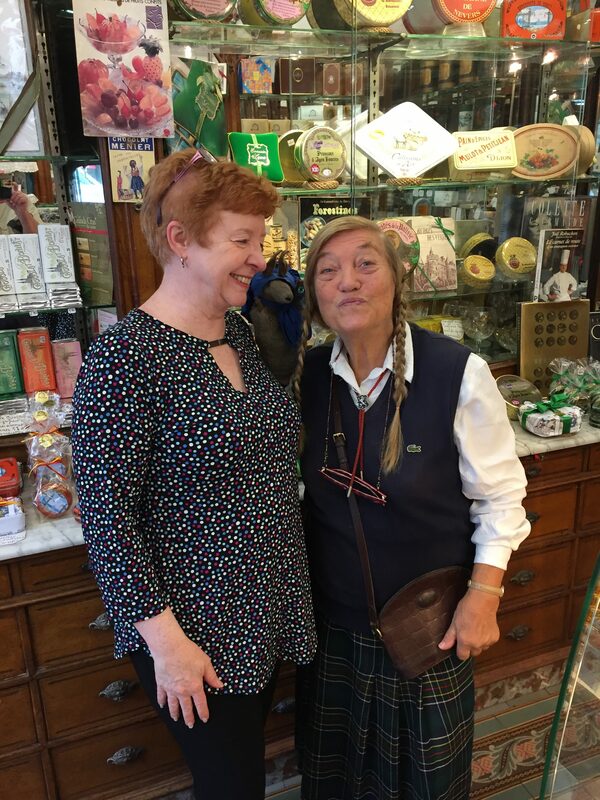 But the shop has been restored with beautiful mirrors and woodwork, and is filled with delicious candies from all over France. 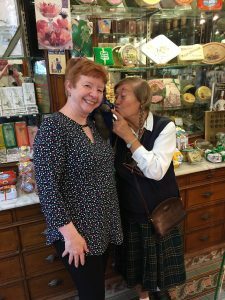 We visited the shop in search of the famous French Christmas candy, the papillot. The legend of this candy stems from Lyons, France, shortly after the French Revolution. Sir Paillot was a candy-maker, and one of his apprentices was in love with a young laundress who worked above the candy shop. To show his love to her, the apprentice would write a message of love inside glossy paper and wrap it around a piece of candy, then give it to his beloved. He was caught stealing the candies by Sir Palliot, who dismissed him. Then, Sir Palliot realized that the young man’s idea of wrapping candies in paper with special messages was a brilliant marketing strategy. (Some say he re-hired his apprentice, some say he stole his idea.) He called his new product “Papillote.” It’s now a popular Christmas tradition in France to eat these famous chocolate bon-bons. Madam Acabo had never seen an armadillo, but you can see from the pictures she took quite a liking to me. In thinking back over my trip, this visit to “the most famous chocolate shop in Paris” just may be my favorite memory. March is the month that many Texans take a “spring break,” and Galveston is a popular destination. 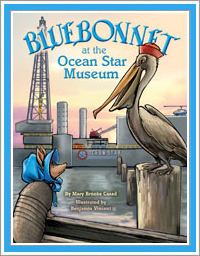 Seven years ago MBC received a call from the staff at the Ocean Star Museum in Galveston requesting a visit from Bluebonnet. 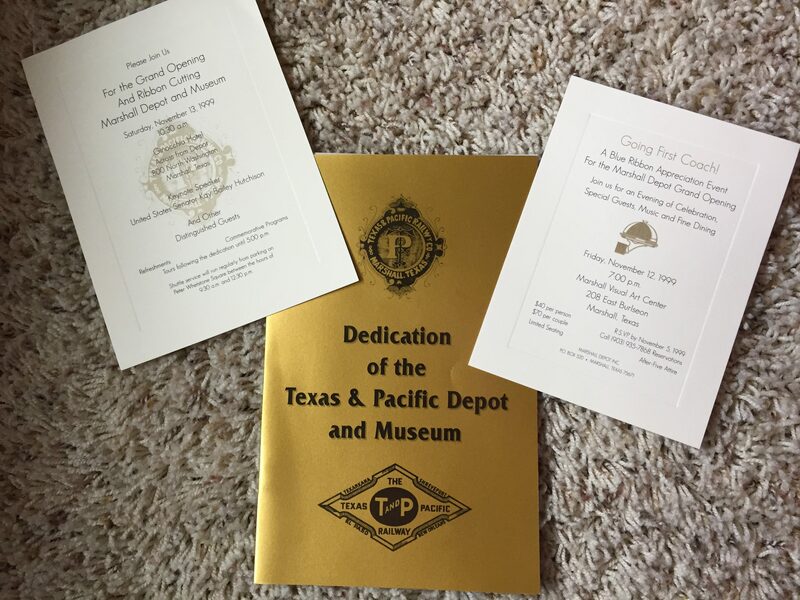 The museum, housed in an off-shore drilling rig in the Galveston harbor, was celebrating its 15th anniversary in 2012, and they wanted a book to commemorate the occasion. Illustrator Benjamin Vincent and MBC visited the Ocean Star soon after that to learn about life on an off-shore drilling rig. The staff was most helpful in giving them a tour and explaining the equipment. MBC and Benjamin noticed that pelicans liked to congregate on the decks, and MBC decided to create a special pelican friend for me. 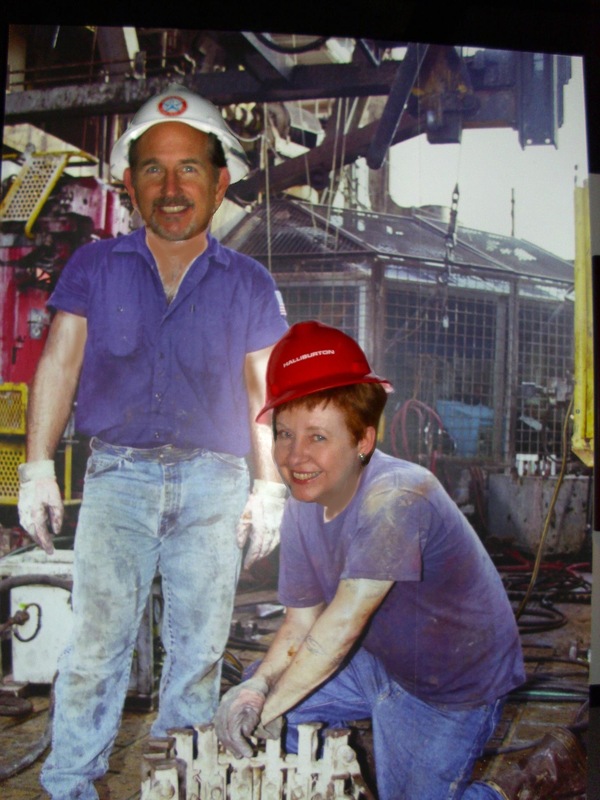 She named him “Red” after the famous oil rig firefighter Paul N. “Red” Adair. Benjamin Vincent gave him a red sailor’s hat. MBC and I also have a special connection to pelicans, since most of the Bluebonnet Armadillo Adventure series was published by Pelican Publishing Company. Benjamin and MBC had quite a fun day learning about the Ocean Star and brainstorming about the book……after all, they make a pretty good team! Shortly after their visit, MBC completed the manuscript, and Benjamin went to work on the illustrations. The book was published just in time for the museum’s 15th anniversary! A few months later, MBC and I returned to the Ocean Star for a book signing. 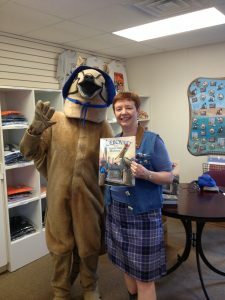 It was a very fun day, especially when I met a brave volunteer who was dressed up like ME……biggie-size! The museum also awarded prizes that day to children who could find characters from my stories, hidden throughout the museum. MBC’s favorite thing about this adventure is the boy she named Ben (her father and nephew’s name, as well as the name of our illustrator!) In the story, Ben is one of the school children visiting the Ocean Star. He sees me several times, despite my best efforts to stay hidden, but no one believes him. Finally, at the end of the story, he’s proven right. The book is dedicated to MBC’s three grandchildren, Revol, Patrick and Ana. She hopes that all schoolchildren can take advantage of the educational programs offered at the Ocean Star and visit this amazing museum. So, if you’re headed to the Galveston beach this spring or summer, read about my adventure at the Ocean Star, then plan to have one of your own! Texans remember the brave heroes of the Alamo who died on March 6, 1836 with the cry “Remember the Alamo!” The epic story of this great battle, which took place in an old mission in San Antonio, is etched deeply in the hearts of Texans, who honor the sacrifice of the fallen that led to independence….the Republic of Texas. 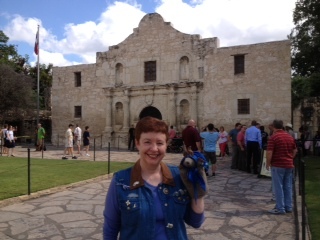 When MBC is asked which of my adventures is her favorite, she will respond quickly “Bluebonnet at the Alamo!” In the summer of 1983, the first book in the Bluebonnet Armadillo Adventure Series, “Bluebonnet of the Hill Country, was published, right after the birth of MBC’s second son, Carter. The day before Carter’s birth, MBC was at the Dallas Public Library, researching Alamo history. As MBC likes to tell it, there were pages and pages in stacks of books that she read through, but it only took one sentence to give her the story idea. The sentence stated the fact that Jim Bowie’s personal Bowie knife was lost at the battle of the Alamo, and to this day, no one is certain what became of the knife. MBC seemed to know right away that Great Great Grand Diller had found the knife and hidden it away in his burrow. Sometimes stories come as gifts; such was the case with this one. It sort of took over, and in a short time, MBC discovered it had written itself. She’s especially fond of Digger Diller, whom she based on several “larger than life” Texans she’s known. The first edition of “Bluebonnet of the Alamo” was published in 1984 by Eakin Press, illustrated by Pat Binder. In 2013, MBC revised the story slightly, and it was illustrated by Benjamin Vincent and published by Pelican Press. Both books have been sold in the Alamo gift shop. 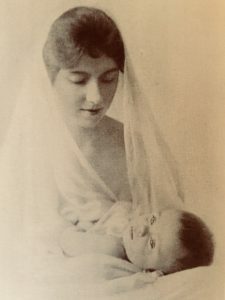 Both of the Alamo books were dedicated to Mary Kelley, MBC’s maternal grandmother, who was noted for reminding her children to “Remember the Alamo” as they left the house. That became family code for “Remember who you are. Remember that you are a part of this family, you are loved. Remember that with these gifts come expectation and responsibility.” Perhaps she didn’t realize what a tradition she would start, how this saying would be passed down across the generations. But it’s become the motto for her family. So, for all these reasons, the story of my adventures at the Alamo remains MBC’s favorite. 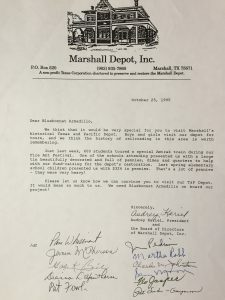 MBC and I have been thinking about Marshall, Texas a lot lately. And we’re still working on telling the “story behind the story” for each of the Bluebonnet books. 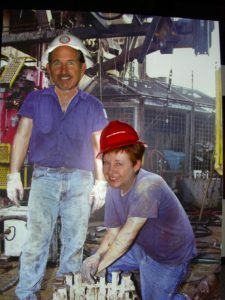 Last year, we celebrated my 35th birthday, dated from the time the first Bluebonnet Armadillo manuscript was completed. 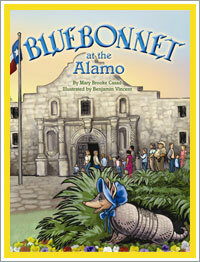 This year, we are celebrating 35 years since the first Bluebonnet Armadillo book was published. letter prompted several more letters and phone calls and a trip to visit the Depot and Marshall elementary schools. 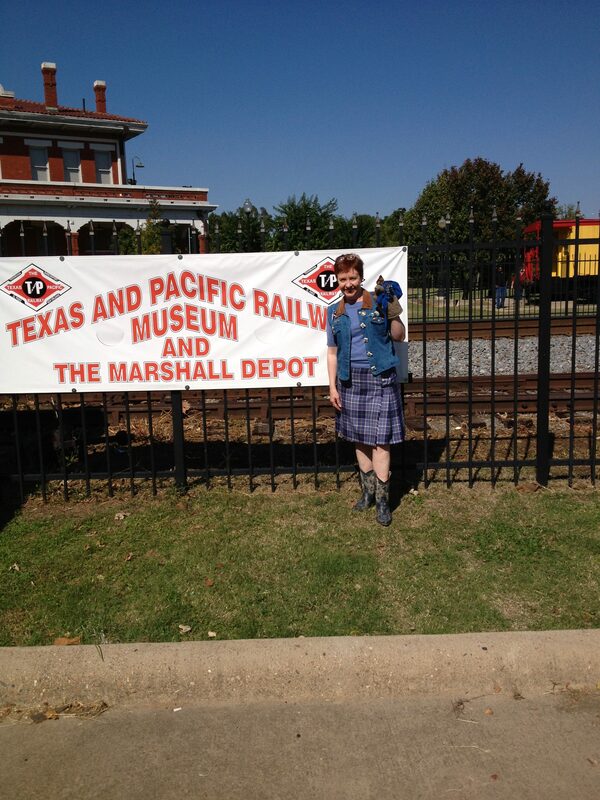 Marshall Mayor Audrey Kariel and Bluebonnet fan Marjorie Perkins provided MBC with Depot history. 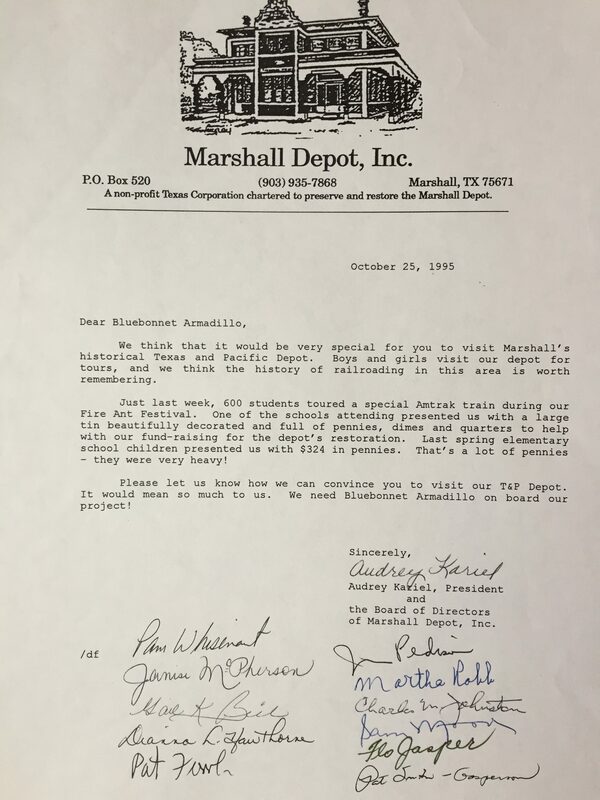 And we were inspired by stories of Marshall’s school children who saved pennies for the depot renovation. 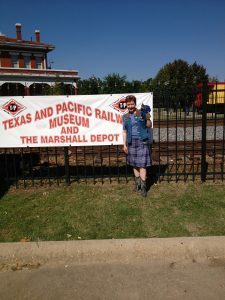 MBC and I still like to visit Marshall whenever possible; we were at the depot for the Centennial Celebration on October 20, 2012. We were even in the “Wonderland of Lights” parade one year. MBC often stops by the cemetery where several relatives are buried, including her great-great grandfather who immigrated from Ireland. And she always likes to stop at Neely’s for a Brown Pig. MBC is still glowing about that compliment! So……what family connections do you have to special places that you could write about? MBC and I hope you’ll pursue those stories, and find writing about them just as rewarding as we did. Today is opening day of the State Fair of Texas! 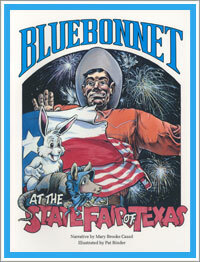 MBC and I are recalling my adventures at the State Fair, chronicled in the third book of the Bluebonnet Armadillo Adventure series, published in 1985 by Eakin Press, with Pat Binder providing the illustrations. MBC had attended several state fairs by the time she wrote this book, but her research was greatly aided by State Fair staff Wayne H. Gallagher, Nancy Wiley and Elizabeth Peabody. She was most grateful to good friend Karen Matney Brown for helping her make those connections. MBC’s parents had a neighbor at that time, a young girl named Sara Grein. Sara suggested the name “Armadilly” which MBC gratefully used in the book. Aunt Armadilly lives at the State Fair of Texas and of course, she’s the one I was going to visit. Fortunately, Aunt Armadilly used her creative imagination to give me a tour of the fair! And once again, MBC’s mother-in-law, Dede Casad, suggested that Big Tex help point Bluebonnet and Joe Bob in the right direction when they get lost making their rounds at the fair. The original Big Tex is also depicted on the cover of the book. So, as is usually the case, writing a book is a team effort! MBC is grateful to all who contributed to this tale of the State Fair, which continues to provide information and amusement to fairgoers. Originally published in hardback, the book is now available in paperback through Pelican Publishing Company. MBC thought that was a pretty good idea. A few weeks later, as she and her husband Vic and their one-year-old son McCrae were walking on the shores of Lake Bridgeport, an armadillo came up to MBC, stood on its hind legs and sniffed, then wandered off. MBC took that to be a sign! She should write about armadillos! She returned home (at that time she lived in Grand Prairie), went to the public library and began researching armadillos. She also thought about her first encounters with armadillos as a child in the Texas Hill Country, where she attended Camp Waldemar for seven summers. Plus, as she liked to say, she just used her imagination. So, an armadillo character began to emerge, with her blue sunbonnet as a trademark, named Bluebonnet (suggested by Dede and Vic). MBC enlisted the help of elementary teachers Ben and Juddi Gilmore, and Joan Dobson of the Grand Prairie Public Library. She finished the manuscript on her birthday, September 15. So it became my birthday, too! 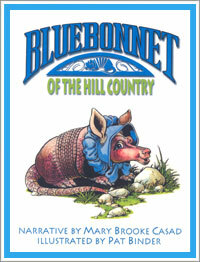 “Bluebonnet of the Hill Country” was published by Eakin Press in June of 1983, a month after MBC’s son Carter was born. Pat Binder of Plano created the illustrations. 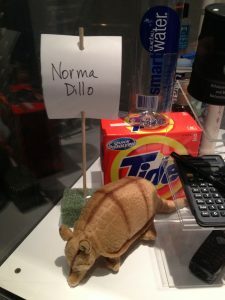 This story introduces my Mommadillo and Daddidillo and my three sisters Normadillo, Irmadillo and Arvilladillo (if you want to know why I have three sisters, you’ll need to read the book!). It teaches lots of facts about my Hill Country home and armadillos. The story reveals how I got my trademark sunbonnet, and of my desire to go to summer camp. When Eakin Press was sold several years ago, this book went out of print. 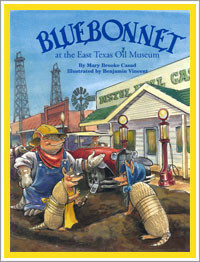 Last year, MBC tweaked the story and gave it a new title, “Bluebonnet of the Texas Hill Country.” Eakin Press published the book in April, 2016, with Benjamin Vincent’s illustrations. So today, MBC and I are both celebrating birthdays…..35 years is pretty significant for me! As MBC frequently says, the best thing about being a story book character is immortality! I’m forever young! MBC and I are grateful for these years together, our wonderful adventures and the amazing friends we’ve made. Thanks for a wonderful idea, Dede! Perhaps you think an armadillo named Bluebonnet is a bit odd, but how about a pig named Bunny? That’s the name Ruby Clyde gave her pet pig. Of course, Ruby Clyde is an interesting name, too. 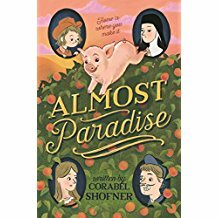 But somehow, it fits the spunky character of Corabel Shofner’s debut novel Almost Paradise, published by Farrar Straus Giroux, New York. MBC learned about this book several months ago when she was reunited with Corabel, a childhood friend, via social media. She’s been eagerly anticipating the publication of this book, written for middle readers, grades 5-7. But after reading it, she recommends it for ALL readers. Now the book totally captivated MBC. After all, it’s set in the Texas Hill Country (where I was born!) where MBC spent her childhood summers at camp; in fact, that’s where she and Corabel met. The story is sure to tug at your heart as you learn Ruby Clyde’s life story. Not an easy life, but it’s helped her become strong and courageous. We won’t give too much away, but as MBC says, she did not see the ending coming. Quite a dramatic conclusion…..one full of love, self-sacrifice and redemption. MBC gave this book five-stars on the Amazon review and concluded by saying: “I closed this book with a smile on my face and a tear in my eye.” It’s the kind of book you’re sorry to see end, because you’ll miss the characters so much. So, whether you’re a middle reader or not, MBC believes you’ll enjoy Almost Paradise. As for me, I’m always glad to make a new storybook friend, including a pig named Bunny. That’s right, MBC and I are on a quest to visit more than 16,000 Texas historical markers! With markers scattered all across our state, commemorating persons, places and events important to Texas history, MBC and I have decided to stop and capture these markers on camera. After all, my very purpose for being is to teach Texas history! So first up are two historical markers, one in English and one in Mandarin Chinese, commemorating the birthplace of Major General Claire L. Chennault of “Flying Tigers” fame. You can visit these markers at 1501 Monroe St. in Commerce, Texas. This is the first Mandarin Chinese language historical marker in the state of Texas. 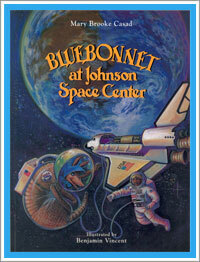 In looking back over 35 years of the Bluebonnet Armadillo Adventure series, MBC remembers that the book about my adventure at Johnson Space Center was certainly one of the most thrilling to research. The good folks at the Lyndon B. Johnson Space Center in Houston, the National Aeronautics and Space Administration’s (NASA) Manned Spacecraft Center www.nasa.gov were most helpful to MBC, inviting her to tour “behind the scenes.” She climbed up into the space shuttle where astronauts trained, and also saw the giant swimming pool for underwater training (that gave her the idea of using armadillo swimming techniques in the story!) Staff members helped her throughout the writing process with the manuscript to insure that the technical parts of the story were accurate. One even suggested the idea that my armadillo shell be used to study ways of improving astronaut suits in the story! Space Center Houston, www.spacecenter.org the visitors’ center for the Johnson Space Center, was just being built when MBC did her research, so the book was timely in helping introduce this fabulous facility. Less than a year after the center opened, MBC and I did a book signing in the gift shop. The story certainly captures the era of the Space Shuttle flights. MBC and I salute the many astronauts who bravely flew these space missions, and honor the memory of the Space Shuttle Challenger and Columbia astronauts. The story also honors the work of many people who have worked at Johnson Space Center over the years. To all you future “astrodillos” out there, keep reaching for the stars! One of my most popular tales of my Texas travels is about my adventure at Dinosaur Valley State Park. Now this book came about following a trip MBC made with her family more than 30 years ago. They journeyed to Glen Rose, Texas for a day trip with their good friends, the Gilmores. MBC remembers it as a very fun time of swimming and picnicking, and she remembers the excitement her sons and the Gilmore girls had over seeing the dinosaur tracks along the Paluxy River. MBC had recently seen a museum exhibit featuring a fossil of a glyptodon. A glyptodon was a pre-historic mammal, cousin of the armadillo, that looked a lot like an armadillo, but boasted a large ball of spikes on the end of its tail. MBC named my new glyptodont friend Glyndon P. Glyptodon, but her son McCrae quickly nick-named him Spike. As MBC began to create the storyline on that hot summer day at Dinosaur Valley State Park, she remembers that friend Ben Gilmore offered the idea of the glyptodon’s discovery by the footprints he left behind, picking up on the dinosaur tracks found at the park. That idea helped MBC quickly write the story. 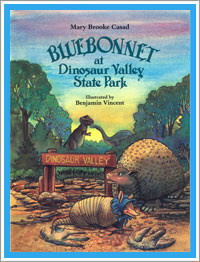 “Bluebonnet at Dinosaur Valley State Park” was the first book of the Bluebonnet Armadillo Adventure series to be illustrated by Benjamin Vincent and published by Pelican Publishing Company. The first printing was 1990; a second printing followed in 1995. As always, keep reading and writing! 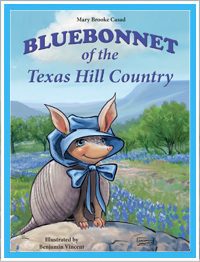 Bluebonnet the Armadillo travels to interesting places in the State of Texas, exploring, seeking adventure and learning the history of the places she visits.